Fresh Air: Trauma Surgeon Joseph Sakran Talks About Gun Violence : Shots - Health News When Joseph Sakran was 17, he was shot in the throat after a high school football game. That experience inspired him to become a surgeon — and to speak out against gun violence. 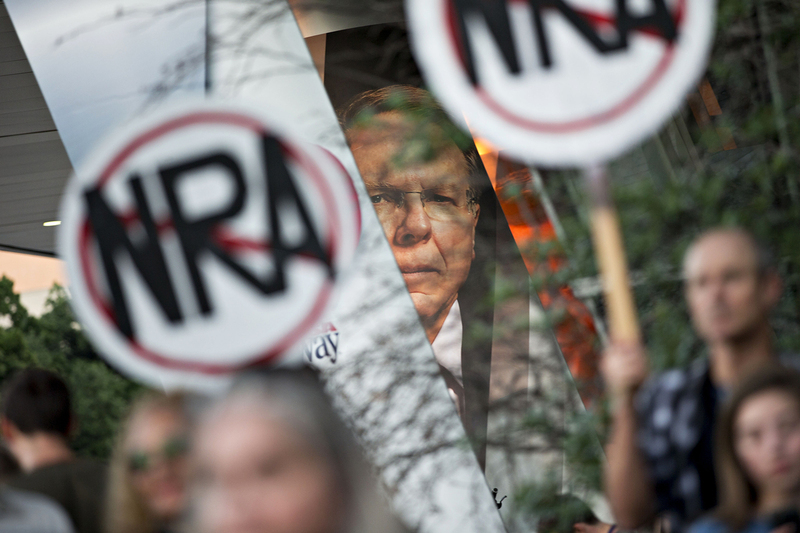 Protesters gather beneath a banner featuring Wayne LaPierre, CEO of the National Rifle Association, during a rally outside the NRA's annual meeting in Dallas in May. 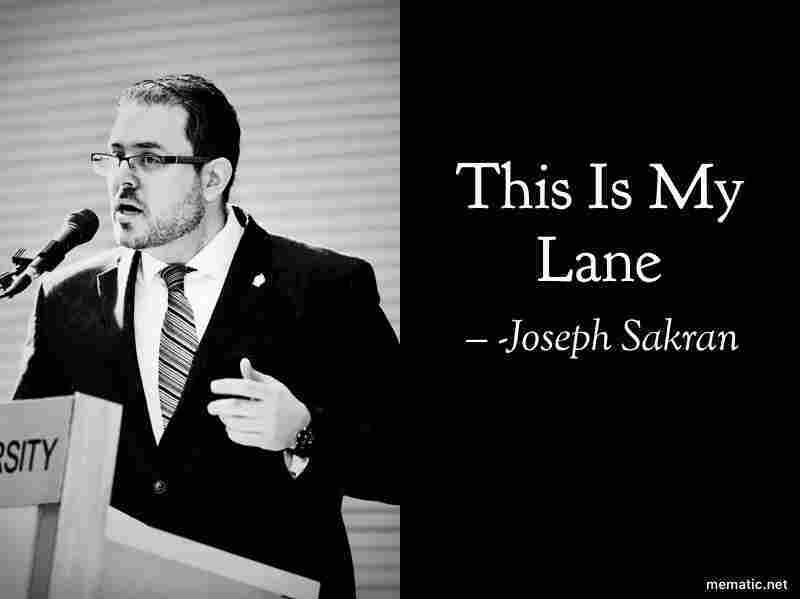 When the NRA told doctors to "stay in their lane" instead of weighing in on gun policies, Dr. Joseph Sakran used Twitter to express his outrage. For trauma surgeon Joseph Sakran, gun violence is a very personal issue. He has treated hundreds of gun wound victims, comforted anxious loved ones and told mothers and fathers that their children would not be coming home. But Sakran's empathy for his patients and their families extends beyond the hospital. Sakran knows the pain of gun violence because he is a survivor of it; when he was 17, he took a bullet to the throat after a high school football game. Maybe that's why he felt the need to do something when the NRA tweeted on Nov. 7, "Someone should tell self-important anti-gun doctors to stay in their lane," in response to the American College of Physicians' position paper on reducing firearm injuries and deaths. "My first reaction was kind of incensed," Sakran says of the NRA's tweet. Then, he sprang into action, creating the Twitter account @ThisIsOurLane and encouraging other medical professionals to share their experiences treating victims of gun violence. Some of the responses have been graphic, but Sakran, who is director of emergency general surgery at Johns Hopkins Hospital in Baltimore, says that helps drive home the point: "By seeing a lot of these photos of bloodstained scrubs or by seeing an operating room floor full of blood or an empty waiting room, it's made it real." When it comes to gun violence, Sakran says, "a lot of times people talk about statistics and numbers, but I think it's so important to move beyond that, because these aren't just numbers — these are people. These are fathers, mothers, members of the community that we interact with day in and day out." It was after a high school football game where we were just hanging out with some friends the way typical high school students do, and we were at a park at a nearby elementary school when a fight had broken out between two individuals, and a guy pulled out a gun and started firing into the crowd. At that point I got hit in the throat with a .38-caliber bullet. It might sound a little bit crazy, but it was almost as if I was watching myself and I was watching the pre-hospital workers put IVs in me, ask me different questions, almost like an out-of-body experience. ... They were having to perform an emergency tracheostomy, which is providing a secure airway, because I had a ruptured windpipe. I often think about this in regards to kind of what I do on a daily basis, and I always tell people the worst part of my job is going out to those waiting rooms and having to talk to families and tell them that their loved one is never coming home. There was a very profound moment that happened during my recovery period that changed how I thought about what had just happened. I was standing in the bathroom looking at the mirror and I was looking at the scars that I had. At that point I still had the tracheostomy tube, and my father happened to be walking by and kind of peeked in. I think he saw the distraught look on my face and ... he said, "What happened was horrible, and either you can look at your scars and the tube that you have in your neck and feel sorry for yourself, or you can take this second opportunity and really make a difference for other people." And it was that moment that really I think changed me for the rest of my life. It's never easy. It's by far the worst part of my job, but it's part of my job. I think having been a victim and now a provider I have a unique experience and I think one of the things I always try to do is to have empathy. I think that it's very different than sympathy — really being able to kind of put yourself in their shoes and what they must be feeling and going through. When I walk out there to talk to these families, I often will just kind of stand there for a little bit and just look through the waiting glass window, and it's difficult. Sometimes I know that what I'm about to do is going to completely change your life. And I look at their faces and ... these are all mothers, fathers, sisters, brothers that obviously care for this person who has just been injured. And so I try to be as empathetic as possible, and provide them with as comprehensive as possible a detail of what just took place. I often do share this story with my patients and families later on if they're lucky enough to have survived. I use that in a variety of different ways. But some patients will look at me and think, "OK, what does this person understand about gun violence?" When I tell them my story, it allows me to relate to what they've just been through, but also what they've seen from so many years in their own community. I think there would be really three things: The first is expanding universal background checks. The second is ensuring that we have federal funding to provide data-driven solutions. And the third is focus on safe storage and education. Therese Madden and Seth Kelley produced and edited the audio of this interview. Bridget Bentz, Molly Seavy-Nesper and Scott Hensley adapted it for the Web.